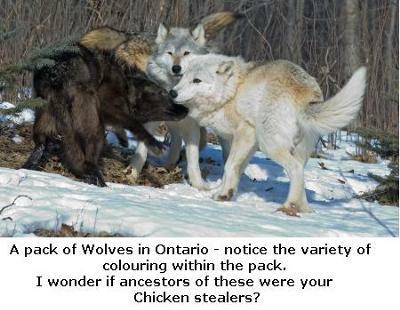 Living in Brechin, Ontario as a teenager some 25 yrs ago, I would hear and see one to two Wolves that lived on and around our 50 acres of land. I clearly remember their cries, and sightings of them, one grey Wolf one dark brown/black Wolf. I also have a vivid memory of having more than 20 chickens in a shed with a 6 foot fence around, and waking one morning to only one live chicken! All the chickens were gone, and not a sound heard! I will always remember these beautiful Wolves, although I loved my chickens I felt no ill will towards these wonderful Wolves. I no longer live in Canada, but have fond memories of Canada and the Wolves and pray that generations later, they still live on. If anyone else has seen or heard Wolves recently in this area, I would love to hear their story. Thank you so much for your story - if any of our readers live in the Brechin area, and have seen or heard Wolves lately, I hope they write in to tell us about it! That must have been wonderful to have lived so close to Wolves when you were younger - I know that there no more Wolves in England, since they became extinct in the 15th or 16th Century. I'm glad you got to see some Canadian ones!